Cahernageeha is a townland in the parish of Kilcrohane, whose name means 'stone fort of the wind'. Cahernageeha Mountain is the 571st highest place in Ireland. Starting from the crossroads in Caherdaniel (V 5510 5950 A), take the narrow tarmac road which leads northeast from the village, keeping right at the junction at 'Coom Cottage'. The road is pretty much flat for the first mile before starting to rise gently. After 1.5 miles, the tarmac road turns sharply back left, however you should continue straight ahead on the stone track. This track leads gently up the the head of the valley before switching back a number of times to zig-zag up the slope. When the slope flattens out again, you have reached the saddle between Cahernageeha and Mullaghbeg. Here the track branches off (V 5550 6230 B B) to the right for Mullaghbeg and continues on to the left for Cahernageeha. For Cahernageeha, the track to the left continues for 0.5 miles, at which point you can follow the fence line for another 0.5 miles of grassy boggy open mountain to the summit. 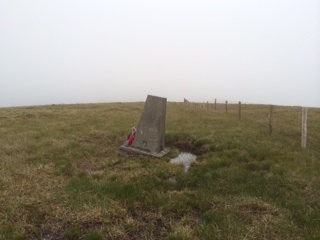 The summit is marked by a trig pillar which is listing badly, presumably due to its boggy foundations. I can't vouch for the view from the summit as the mist had rolled in by the time I got there, but the views of Derrynane and Lamb's Head from the saddle below were impressive. I retraced my steps to the fork in the track (V 5550 6230 B B) and headed this time for Mullaghbeg. Again, it's approx. 0.5 miles before the track ends. Turn left onto open mountain at the end of the track and it's about 0.5 miles to the unmarked summit. Good views to be had here down to Lough Currane and Waterville directly below and further afield to the other peninsulas.